Chinkapin oak, sometimes spelled chinquapin, is from the Virginia Algonquin chechinquamin, referring to dwarf chestnut, Castanea pumila, which was an important food source for eastern Indians. Chinkapin was later applied to several species in the genera Castanea and Castanopsis. The botanical name, Quercus muehlenbergii, is from Latin Quercus (oak, from proto-Indo-European kwerkwu) and muehlenbergii (for the botanist Fredrick Muhlenberg). The misspelling muehlenbergii instead of muhlenbergii, was inadvertent, but under the rules of biological nomenclature, the 'wrong' spelling has to stand. 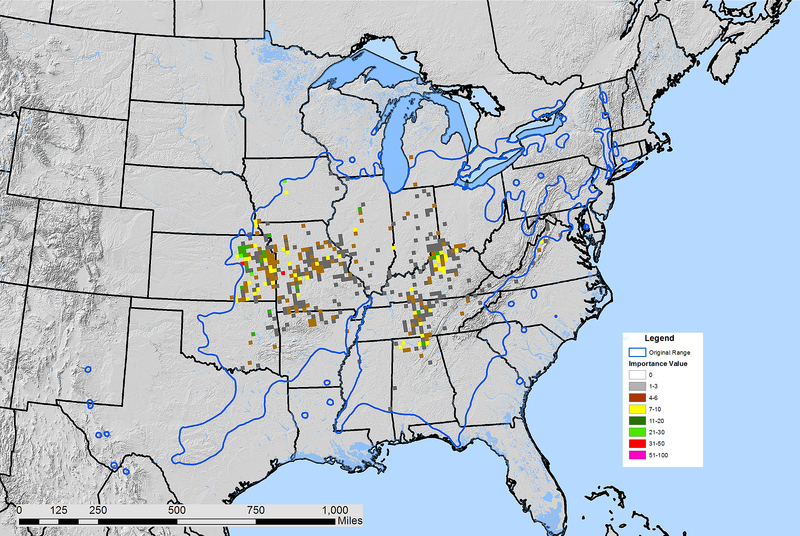 Range: Midwestern, reaching its peak in importance value in the Bluegrass, Nashville Basin and central Missouri and Kansas. The very large range stretches from Vermont to northern Mexico. Habitat: Limestone-derived upland soils, occasionally on creeks if limestone is present. Quite drought tolerant and able to withstand the rigors of life on karst. Life History: A slow-growing long-lived species. Intolerant of shade, though it can persist in a shady understory when young. Produces abundant acorns at irregular intervals, but reproduction is a rare event in many areas. 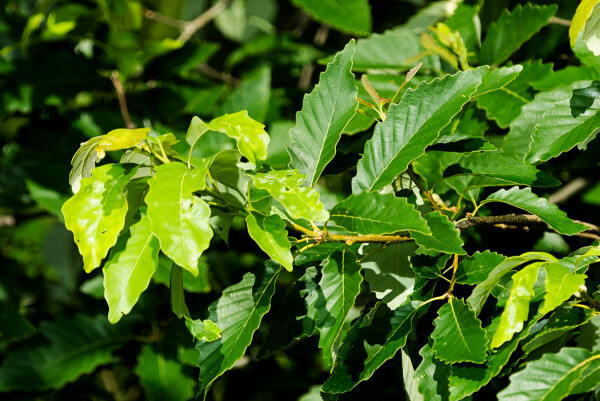 In the Bluegrass, we see very little natural regeneration of chinkapin oak. Form: Open grown trees are massive, with thick boles. The crowns are finer than bur oak, and the tree generally has a more elegant appearance. In forests, chinkapin oaks are tall dominant canopy trees. Uses: Generally mixed with white oak when found. 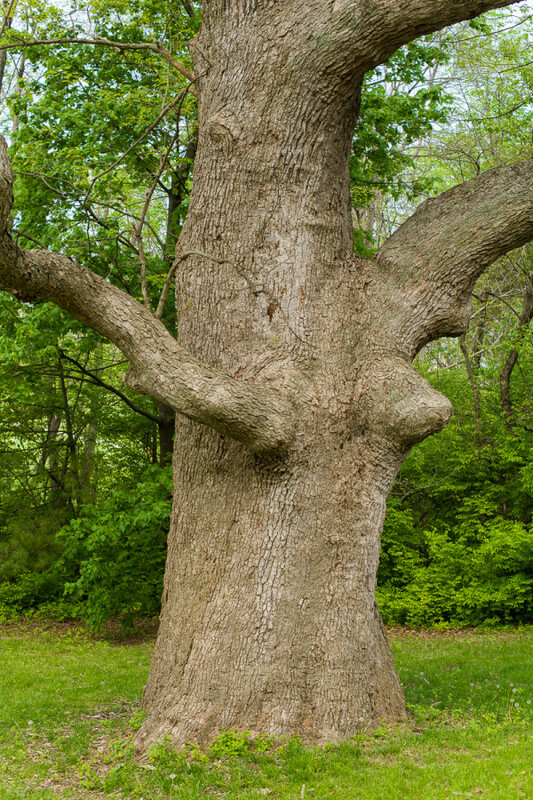 Previously valued as yellow oak with denser wood than other white oaks. Largest known chinkapin oak: 99 inches diameter, 76 ft. tall, 69 ft crown spread, Harrison County, KY.
Largest Bluegrass chinkapin oak: 99 inches diameter, 76 ft. tall, 69 ft crown spread, Harrison County, KY.
Hybrids other white oaks are fairly common, including hybrids with white oak (Quercus alba), swamp white oak (Quercus bicolor) and bur oak (Quercus macrocarpa). 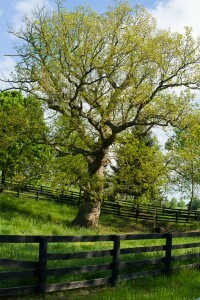 Deam oak, Quercus macrocarpa x muehlenbergii, is occasionally found in Bluegrass, and bears viable acorns.